This is not a High School Musical post, but I couldn't resist! For the look, I pretty much wanted to try out some new things that I've recently purchased. I wasn't really aiming for something in particular though and just played around with what I had. 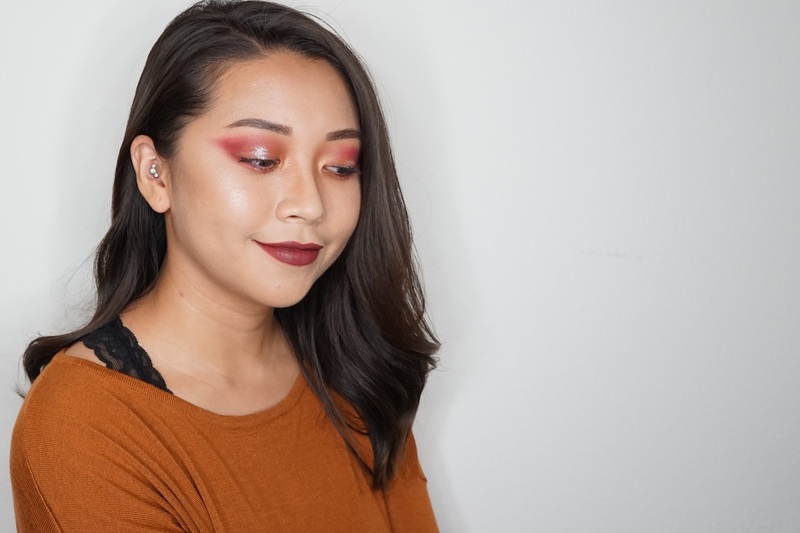 Like some other looks I've done, I went for a more angular smoked out eye look but it kind of looks weird straight on. In the post, I'm going to kind of ignore the stuff I've used before and mostly address the newer things I played with. Also side note - there's a too warm nose contour going on and that was an accident. I was doing an eye shading thing in the inner corner that I've some some of my favorite YouTubers do, but then it started to go more down and became a nose contour. Holy smokes. The Guerlain Météorites though. I used the Sephora VIB Rouge gift card to help buy this and it's something I've been wanting for a couple of years, but I still can't get over the price for what it is. I'm so glad that powders last forever though because I do like it, but don't want to repurchase it for another good couple of years. I actually used both bronzer colors from the NARS Palette and the contour shade from the Kevyn Aucoin palette. 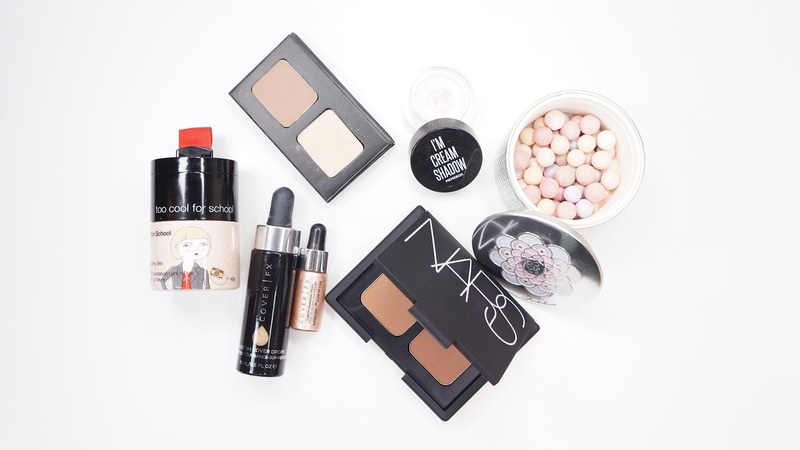 I've always like Laguna but I felt like Casino would work better for my skin tone and so I was so happy to see the duo on the NARS website. For this look, I used Laguna to warm up my whole face and Casino near my contour area / right above my contour area to add dimension. To create more depth, I went in with the Kevyn Aucoin Sculpting Powder in Medium. I also went crazy on the highlighter and layered everything. The Cover FX Customer Enhancer Drops in Moonlight is new to me and I really wanted to try it out on a non-work day. 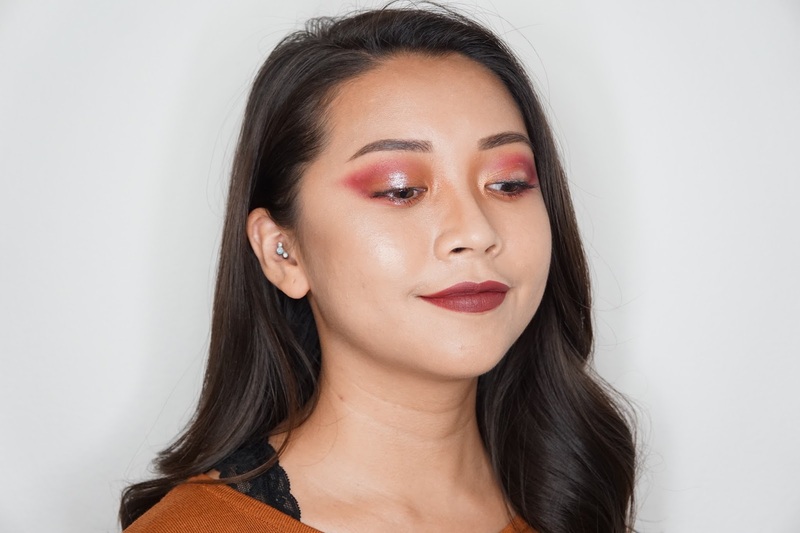 I initially used the highlighter from the Kevyn Aucoin contour duo on top of the drops, but then last minute decided to add glitter that I used on my eyes to my face as well. Because why not? 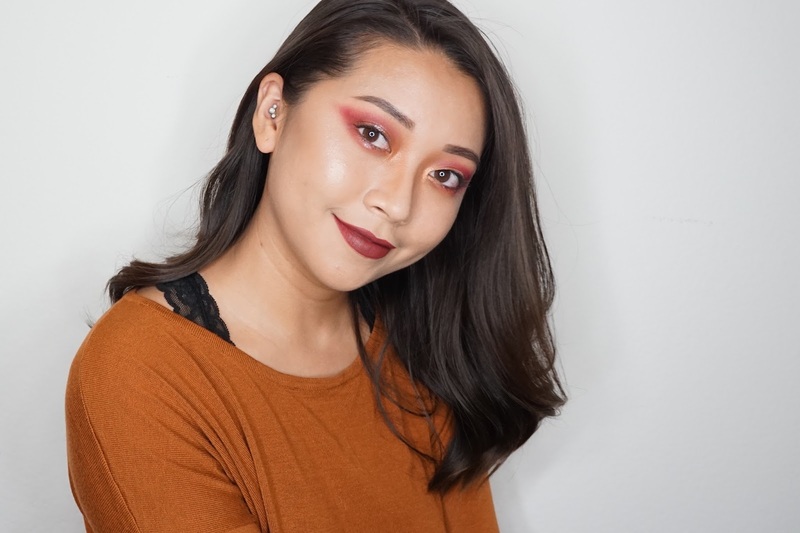 I haven't had time to play with the Kylie Cosmetics Burgundy Palette or the Makeup Forever Artist Shadow in M-846 Morello Cherry and so this seemed like the perfect opportunity to use them both! Morello Cherry was a bit hard for me to blend out because it is so pigmented. I also have a spot on above my eyes where shadows stick on weirdly though. 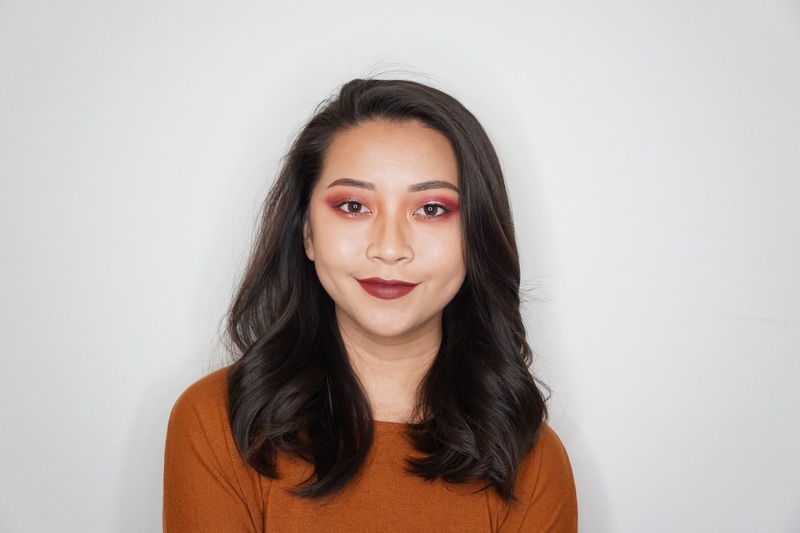 I used Morello Cherry to create the whole shade and smoke, but used mixtures of the Kylie Cosmetics eyeshadows to do the rest. To top it off and add shine, I also used the same cream pressed glitter on my face from Memebox. I was originally planning on wearing lashes since my own lashes disappear when I do anything more than basic, but I messed up and ended up taking it off. Because I messed up, the dark lash glue I used did leave a black line behind that I tried and failed to hide using the black pencil liner from Makeup Forever. 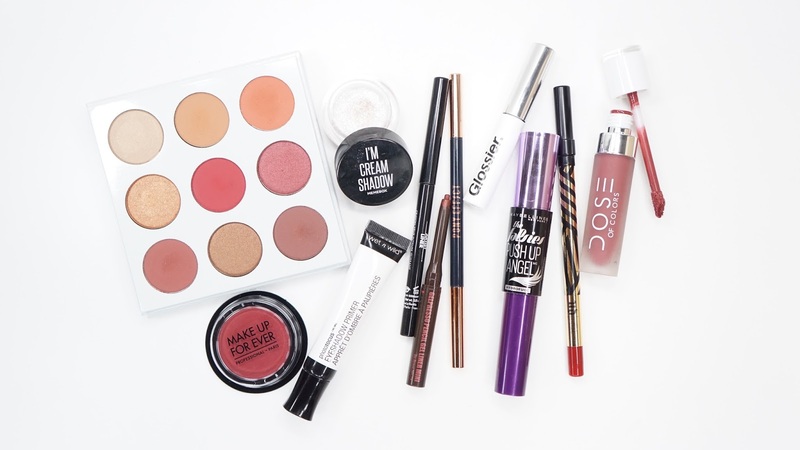 The eye liner I did intentionally use was the Clio Gelpresso Pencil Gel Liner in Be Brave! t's a year or two old and so it was kind of dry though. It worked enough for my waterline, but I definitely need to get a new one. Lastly for the lips, I wanted a dark red to match Morello Cherry. Urban Decay 24/7 Glide On Lip Pencil in Rock Steady was too red and Dose of Colors Matte Liquid Lipstick in Mood was a bit too purple. When mixed together, it became the exact shade I envisioned to finish this look! These two products aren't new, but I haven't been using Mood a lot and so I wanted to start again in my current makeup rotation. I've also been noticing more and more that my top lip is uneven when I smile and so it makes me look like I'm missing the other half of my cupid's bow. Bare faced and everything! My skin has been behaving pretty well though. & that's it! This post was more wordy than I initially wanted it to be but I tried to cut off as much as I could. What other looks should I try? What's new in your collection?